They're the races to boil a season's worth of trials and tribs down to one game. 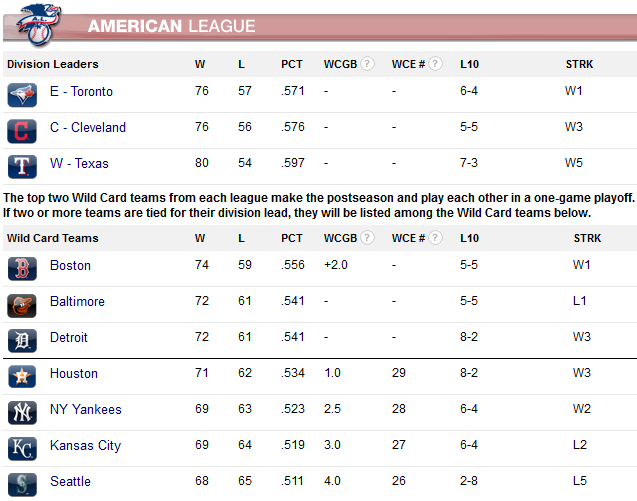 Of course, that one game opens the door to a long and possibly rewarding run in October. 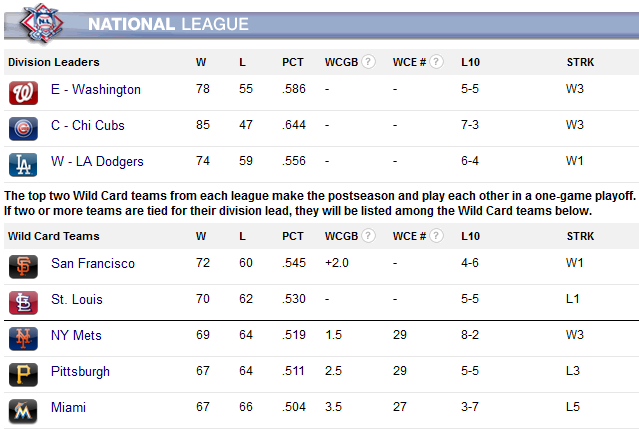 Who knew that an extra wild card slot would put so much fun in MLB's last month of the regular season? Besides an old car salesman, that is. But that's what happens with an unbalanced schedule, when the NL Central's doormats -- Cincinnati and Milwaukee -- played like it. The Cardinals, Cubs, and Pirates were getting fat while the other division leaders faced stronger challenges. That's a cool dozen of MLB's franchises -- 40% of them -- with a realistic chance to keep the dream alive. Meanwhile, the division leaders will be fighting for best-record honors. The exception is in the AL East, where the Blue Jays, Red Sox, and Orioles are doing their best to stay out of the Wild Card game. Others would be more than willing to help. The New York Yankees are the most unlikely contender of the lot. After finally bagging the big-name parade and seeing what their dudes in the system can do, the Bronx Bombers are actually dropping mega-tonnage again. The Yankees have also picked a good time to start winning series. They just successively taken two of three from fellow challengers Seattle, Baltimore and Kansas City. In fact, New York just sealed the series over the defending World Series titlists Royals tonight, taking 13 innings to claim a 5-4 victory and leapfrog them in the standings. Putting it mildly, this will be just one move in what's sure to be a fluid situation.